Our mission is simple: to help your school make the most of SUMO principles in building wellbeing, aspiration and positive relationships in pupils, staff and families. If you’re looking for resources for classroom use or assemblies, you can purchase those individually, or using multi-pack discounts. Our resources embed SUMO principles into lesson plans, teaching resources and ideas which support young people in dealing with common challenges or stressful times, improving their relationships, and in understanding how they can support themselves and their peers. If you’re looking for in-class or student group sessions, or high quality INSET or CPD sessions, we can provide those through our interactive workshops, led by the Foundation’s experienced, qualified teaching staff. 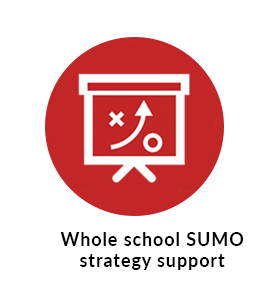 If you’d like to work with the SUMO4Schools Foundation on whole school strategy, or embedding SUMO into your curriculum, development planning, and policies, we can help with that too! Just get in touch and let us know how we can help. The SUMO4Schools Foundation Team have many years of teaching, consultancy and resource-creation experience between them. Whatever your needs in bringing the best of SUMO to your school, they are here to help.